Another funny thing happened on the way to The Forum in the Melbourne CBD on the Sabbath after the 2017 AFL grand final due east at the MCG. The Tigers fans were still roaring on the mean streets of the city while the Adelaide Crows had flown home west to the city of churches and way beyond. Memphis belle Valerie June kicked the dew off the glass with her quartet delivering a potent southern slice from her five album catalogue. Her baker's dozen of songs included her trademark tunes Tennessee Time and Working Woman's Blues and ended with Got Soul. It was an appetiser of sorts for the familiarity fuelled Dylan diet of Old Crow Medicine Show's 50 Years Of Blonde On Blonde tribute. The sextet's Salvation Army style stage entree, replete with their marching band drummer, soared into overdrive with Rainy Day Women #12 & 35. It was clear from the first bounce that Old Crow's raconteur-singer-songwriter-multi instrumentalist Ketch Secor had done thorough refresher research since his band's debut at CMC Rocks The Snowys at Thredbo in 2009. The Virginian's long line of jokes began with a self-effacing gag about being an Adelaide Crows supporter and not being alive when Dylan first toured Australia in 1966 after recording his vinyl double CD Blonde On Blonde in Nashville. Although I flew in from exile in Van Diemen's Land as a cadet journalist on the Launceston Examiner I have vivid memories of Dylan's concert at the Festival Hall boxing stadium and music mecca. It wasn't just the life changing music but the blue and white polka dot shirt worn by Dylan that soon became a fashion accessory on the island and mainland. Ironically, a mere 30 years later I toiled on another newspaper housed in a building a mere 50 metres from the back door of Festival Hall. But that pales into insignificance compared with the repartee of Secor who handled most vocals and also alternated on guitar, fiddle, mandolin, banjo and harmonica while remembering all lyrics to epics Visions of Johanna , Stuck Inside of Mobile With the Memphis Blues Again and Sad-Eyed Lady of the Lowlands. Secor also told an elongated story about listening to Dylan songs since he was 12 years-old. Secor said he and seventh grade school mate and long-time Old Crow guitarist Critter Fuqua from Harrisonburg, Virginia, drove to New York in 1993 on their learner's permits. “I had to go back and see him again when I got my learner's permit,” Ketch joked. They visited the Greenwich Village clubs where Dylan did his time in the folk and coffee mines. It was their entrée to seeing Dylan open for the Grateful Dead after they bought fake acid from a Jamaican in the famed Washington Square Park. Meadowlands stadium was the same locale where this reviewer saw Bob Seger in 1983 before heading back across the river to the Lone Star Café to catch The Bellamy Brothers. “It was fake acid we bought, if the acid had been real, it would have sounded like this,” Secor joked before the band launched into a raucous rendition of Stuck Inside of Mobile With the Memphis Blues Again. We have jumped a few tunes here - bluegrass laced Pledging My Time and the majestic Visions of Johanna. But not Fuqua who took lead vocal on One of Us Must Know (Sooner or Later) before a lilting version of I Want You. Ketch also regaled the audience with tales of Dylan arriving at the Blonde On Blonde recording and stunning the session players who had worked with artists diverse as Loretta Lynn, now 85, and singing actor Dolly Parton. “Bob turned up at 2 in the morning after being holed up in his motel on Trinity Lane for more than 14 hours,” Ketch recalled. This sextet, formed in 1998, started busking on street corners up and down the east coast and Canada, before being discovered by folk icon Doc Watson while playing in front of a pharmacy in Boone, North Carolina. He invited them to play the famed Merlefest and helped launch their eight album career and solo projects by Willie Watson and Gill Landry. Meanwhile back at The Forum. Kevin Hayes on guitjo (a guitar/banjo hybrid) led the lads on a dancing dervish with his humorous sartorial satire Leopard-Skin Pill-Box Hat with steps rarely seen at the Forum since late Toorak thespian Frank Thring abandoned his Ben Hur chariot. Secor also introduced Nashville multi-instrumentalist Cory Younts for a lead vocal on Just Like A Woman and One Of Us Must Know. 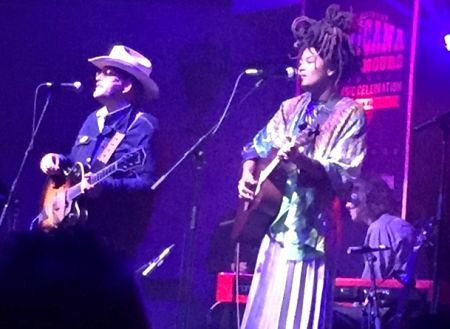 “After Bob Dylan recorded four albums in Nashville he blew the place wide open,” Ketch revealed. That wry remark prompted laughter. “I'm sure they were a great Australian artist and followed Bob,” he quipped. Secor also detailed protracted meetings with Dylan's handlers about the cover art work for 50 Years Of Blonde On Blonde. Ketch also recalled a cryptic meeting with former Old Crows member Gill Landry and Dylan. 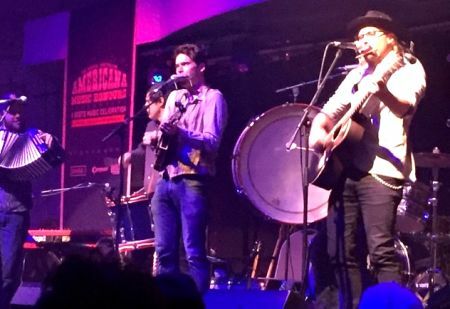 Landry was backstage when Mumford & Sons and the Avett Brothers were backing Dylan at the Grammys. The band followed with Temporary Like Achilles, Absolutely Sweet Marie, 4th Time Around , a bluegrass version of Obviously 5 Believers and fitting finale Sad Eyed Lady of the Lowlands. It was an energetic performance, capped off with band introductions and outros, but there was more after the lights went down. Secor explained the band - featuring bassist Morgan Jahnig and Chance McCoy on fiddle, guitar, banjo and mandolin - wanted to do some of its originals from other albums. They blended Alabama High Test, Cocaine Habit, Tell It To Me and Take Em Away with rejuvenated renditions of Blowing In The Wind and Like A Rolling Stone . And, of course, the Secor rewrite of historic Dylan song Wagon Wheel that became a platinum selling anthem after being a 2013 #1 country hit for former Hootie & The Blowfish lead singer Darius Rucker. While still at school, Fuqua brought home a Dylan bootleg from a trip to London that contained a rare outtake called Rock Me Mama , from the recording session for Dylan's soundtrack to the movie in which he starred, Pat Garrett and Billy the Kid ( 1973 ). Fuqua gave the recording to Secor who was so engrossed he added his own lyrics. That track, Wagon Wheel , featured on an early EP and the band's 2004 album O.C.M.S. and became the group's signature song, on which Secor and Dylan share the copyright. That's been a really significant song for us,” Secor says of the Grammy winning song. But did the singer ever meet Dylan? Secor revealed how his mother drove him to a fortune teller named Ruby on the outskirts of his hometown. “I asked Ruby ‘am I ever going to meet Bob?' Secor recalled. Since then Old Crow has become one of the most revered Americana outfits, with a string of No 1 albums in folk and bluegrass charts - Big Iron World (2006), Tennessee Pusher (2008), Carry Me Back (2012), Remedy (2014) and now 50 Years of Blonde On Blonde. The 14-track album was recorded live at the CMA Theatre inside the Country Music Hall of Fame and Museum in Nashville in May 2016. CLICK HERE for Old Crow Medicine Show's Australian Thredbo debut in our concert page on March 6 and 7, 2009. CLICK HERE for our Old Crow Medicine Show Remedy CD feature in the Diary on April 6, 2015.